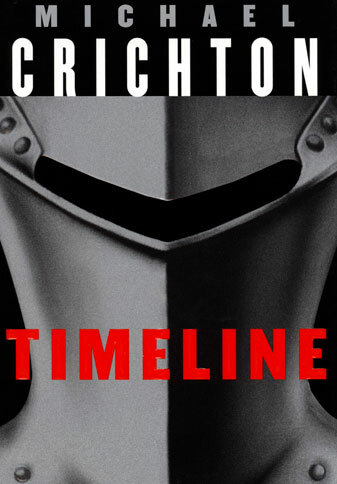 For the last meeting of the Sulzer SF/F Club, we discussed Michael Crichton's 1999 novel "Timeline". 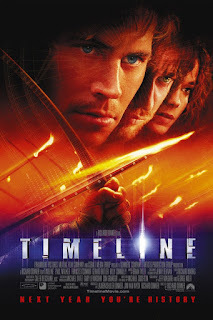 A time travel adventure story, "Timeline" is pretty weird even for Crichton: a tech company that sorta-accidentally sorta-invents sorta-time-travel; naturally, they accidentally strand a history professor in 14th century France, and, naturally, the company's response is to send back his grad students (including one who, naturally, is fluent in multiple dead languages and proficient at period-appropriate combat techniques) to rescue him. A great, meandering discussion ensued--we thought this feels a little rushed, even for Crichton, with some of the most intriguing bits of the book also the most confusing--there are a few major ideas and threads that he either forgot to cut or meant to develop. And, since this is time travel, we spent a lot of time just unravelling the mechanics and comparing it to other work. Spoilers below! Say what you will about Crichton, but he's very adaptable: "Timeline" reads like it was made to be filmed, with very blockbustery-cinematic techniques: establishing shots, well-delineated dialogue versus action sequences, fairly one-note (and therefore easy to portray) characters, and, at least once the action proper gets going, a good sense of pacing. Inevitably, we wound up talking about the 2003 film adaptation (dir. Richard Donner) a bit. I had just finished reading Willis's "Doomsday Book" (1992) for Classic Sci-Fi, which Sulzer SF/F had also read in the past, so we wound up doing a fair bit of comparison "Timeline". Really interesting to set them against each other--"Doomsday Book" is by far the more realistic (Crichton is hilariously blithe and hand-wavey when he needs to be), and with far more human characters. 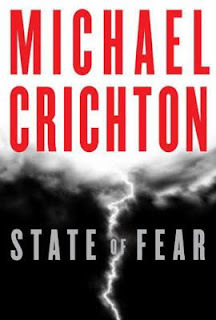 But, to be fair, Crichton is writing in a far different mode, a species of techno-thriller that succeeds at being a page-turner if nothing else. The Arizona police & medical inquiry into Traub's death, which seems at first like it's setting itself up to be the main thrust of the storyline, with characters and hinted-at relationships, only to abruptly evaporate. Stern, Gordon, Kramer, & Doniger--the "back in the present" cast--are really underdeveloped, and it seems particularly like Stern & Gordon's plot could have been more of its own thing, instead of just an exposition-vehicle. Likewise Deckard in the past--he feels like he should be more of a major plot point throughout, but instead he's revealed and dispatched very quickly towards the end. 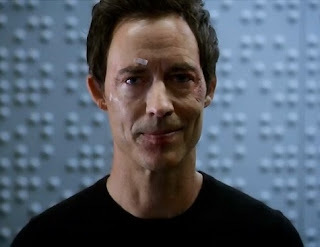 Pretty silly/pointless as a villain, but I liked his little speech as as the one clear vocalization against the corporate/profit mentality that are the real villains here. Was reminded of Caliban's speech in "The Tempest", which led us to an aside on the wonderful recent production at the Chicago Shakespeare Theater. There are some hugely weird things about the "time travel" here that feel like Crichton wanted to explore, else why would he include them? Particularly the idea that ITC can send but not reconstitute signals--that some external force or entity is all that allows their travel. Crichton, his characters, and we the readers are all a bit confused about what kind of time travel is really going on here. At first it seems very clear cut that this is not time travel at all, just travel to an alternate universe whose internal timeline is further back than ours. Thus, no paradox risk, no changing our own past--except that key plot points revolve around it being real time travel, like the Professor's bifocals and 600-year rescue note. The framing of "action in the lab" versus "14th c. France" also clearly spells out that those 36 hours are happening "simultaneously" for both parties, which makes sense in an alternate-dimensions framework, but not in a time-travel one. Make up ye mind, Crichton. Doniger's "paradoxes are impossible, well okay not impossible, but really really unlikely I guess because things are hard to do sometimes" speech is so clearly wrong, so non-convincing, that one has to conclude that either a.) paradoxes are in fact a danger, and Doniger is downplaying them, or b.) paradoxes are prevented by...something else. But Crichton doesn't investigate either of these, leaving us to wonder why the speech was left in there at all. Much discussion of other narratives of time travel, time frames, and alternate universes with timey-wimey elements. Contra Doniger's "it's hard to change the past" idea, I brought up the idea of how it's basically impossible to make any material change to a timeline without it spiralling into huge changes. Ironically, Crichton himself used these ideas in "Jurassic Park" (1990), where he talks about chaos theory & the butterfly effect. The cinematic example that sprang to my mind, for some reason, was the car crash in Fincher's "The Curious Case of Benjamin Button" (2008), where any tiny change would have prevented it and changed the story drastically. Howitt's 1998 film "Sliding Doors" (with those in the know showering John Hannah with praise), which sounds like it has a very similar premise to Jo Walton's "My Real Children" (2014), which Weird & Wonderful discussed earlier this year. The time mechanics in Lewis's "Narnia Chronicles" (1950-56), where time moves differently in and out of Narnia. Time travel & multiverses in the Marvel universe. Time-ish alternate dimensions in the Buffyverse (especially the "Dark Willow" timeline and the "there for centuries!" hell-dimension that Angel gets sucked/stabbed into). The "Outer Limits" or "Twilight Zone" kind of fatalistic time travel story where any attempt to "change the timeline" just confirms it. Rian Johnson's 2012 film "Looper", which is one of the best time travel (and SF generally) flicks I've seen. We particularly talked about its unabashed simultaneity mechanics, which don't really work in-universe, but work perfectly for the viewer. Heinlein's time travel work, such as "The Door into Summer" (1956) and "-All You Zombies-" (1959), the latter of which is really short and twisted and you should read it. The really silly time travel of "The Flash" series. "Black Adder: Back and Forth" (1999), which you can watch online! for centuries" to justify all the murderin'. We talked for a bit about how Marek, the really prepared-for-the-14th-century historian, just kind of starts murdering people left and right without a qualm. If you don't question the action movie-ness of this narrative, fine, but if you look just a little bit harder he uh, he starts to look like a real psychopath. Especially contrasted against "Doomsday Book", where everyone is a real human, it's astonishing how fast "Timeline" falls into action conventions--all the guards and soldiers are disposable mooks and can be murdered at will. How clean/healthy/not-smelly everyone in the past is. Tiny earpieces that can do simultaneous translations to English from multiple dead languages. No-one in the past being realistically skeptical about the time travelers--haircuts, accents, odd knowledge base..."They must be Irish" apparently covers any weirdness in 14th century France. We had some other pointed critiques of the story, particularly the lack of convincing relationships of any kind between any of the characters. We also thought the way Doniger is murdered at the end was out-of-character for Gordon etc., kind of un-called for (he's greedy/ruthless, but not really a "definitely kill him" level villain), and leaves the ending weirdly open--no idea what happens to the company or the technology with him out of the picture. I read most of Crichton's work when I was younger, and coming back to him now, one thing that stands out to me: he's kind of a misanthrope. He goes out of his way to set up and mock people, particularly academics in this case. Chris is constantly realizing that his academic life was "not real enough", not useful, unrealistic. This is just delightfully ironic given the great lengths Crichton goes to letting his readers know that he's done his homework; like many of his books, Crichton blends actual sources and quotes with his fiction to give it all the air of veracity (Feynman quotes in the beginning of this novel, for instance), and has a bibliography. He's showing, as a selling point, how much he relied on academics, in the same book where he relentlessly mocks them as useless and pretentious--with the noted exception of Marek, who apparently has a specialized post-doc in "Murderin' Studies". Crichton even invents a new term of abuse, "temporal peasant", for people who are unaware of history. Not a bad thing to critique, but it feels mean-spirited in execution, and reminds me of the "thintelligence" he uses in Jurassic Park. Another weird thing that I noted about Crichton, that we talked about at group: his attitude towards science, or rather his attitude towards innovation. TL;DR: he's against change. All of his novels deal with huge science & tech-related ideas (time travel, genetic manipulation, nanotech, etc. ), and by the end of every novel those ideas have been contained/nullified, so that the world at the end of the story is the same as the beginning--our contemporary world conceived as essentially static, where potential change is catastrophic and must be averted. Crichton wasn't published as SF for sales reasons--back when SF/F was viewed as a restrictive niche genre, novels with blockbuster or "literary" potential were usually published outside it no matter how clearly science fictional they were--so it's strangely satisfying to recognize his aversion to radical change, which I consider to be one of the hallmarks of SF. where authors just go off the deep end? We didn't even get into his climate science stance and bizarre attacks on his critics. Thankfully, I guess? It's a bummer that he was able to influence people and policies so much (invited to speak to Congress as an expert witness, for example) with such a retrograde/non-scientific outlook. I keep hoping Kim Stanley Robinson or someone similar will get big and famous for the good fight. We also really liked the illustrations! Crichton, extremely rarely among major writers, often used graphics of some kind, a touch I really like--graphs, data, etc. Here in "Timeline", we get maps, architectural drawings, and sketches. Very cool! I want to know more about actual secret door technology, y'know, the push-a-stone and the hidden door silently rolls away type. This led us to a discussion of Al Capone's secret tunnels in Chicago. Fun meeting! Sulzer SF/F will next meet in January to discuss "The Fire Rose" by Mercedes Lackey. By the way, you can check out all previous Sulzer selections on the Chipublib site.